Five Chinese ships have manoeuvred dangerously close to an unarmed US navy surveillance vessel in the South China Sea, the US government says. US officials said the incident on Sunday came after days of "increasingly aggressive" acts by Chinese ships. These violated international law on respecting other users of the seas, a Pentagon spokesman said. As Beijing kept silent, the US made a formal complaint to China's military attache at the Pentagon. The incident happened as the USNS Impeccable was on routine operations in international waters 75 miles (120km) south of Hainan island, a US statement said. 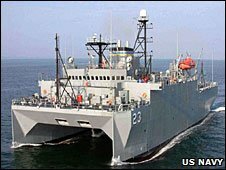 The ships "aggressively manoeuvred" around the Impeccable "in an apparent co-ordinated effort to harass the US ocean surveillance ship while it was conducting routine operations in international waters", according to the Pentagon. Impeccable is designed specifically to detect underwater threats such as submarines for the US navy. Aggressive manoeuvring by ships by rival navies in sensitive international waters is not uncommon but Washington was sufficiently disturbed by the incident involving the Impeccable to make its concerns public, the BBC's Kevin Connolly reports from Washington. The US ship sprayed one Chinese vessel with water from fire hoses to try to force it away, the Pentagon said. But the Chinese crew stripped to their underwear and carried on approaching to within 25ft (8m), it added. The Pentagon identified the Chinese boats as a naval intelligence-gathering ship, a Bureau of Maritime Fisheries Patrol Vessel, a State Oceanographic Administration patrol vessel, and two small trawlers. When the Impeccable radioed requesting a safe path to leave the area, two Chinese vessels dropped pieces of wood in its path, forcing the US ship to make an emergency stop, the Pentagon said. "The unprofessional manoeuvres by Chinese vessels violated the requirement under international law to operate with due regard for the rights and safety of other lawful users of the ocean," said Pentagon spokesman Marine Maj Stewart Upton. "We expect Chinese ships to act responsibly and refrain from provocative activities that could lead to miscalculation or a collision at sea," he said. On Saturday, a Chinese intelligence collection ship challenged Impeccable over bridge-to-bridge radio, calling her operations illegal and directing her to leave the area or "suffer the consequences". At issue in Sunday's incident is the manner in which the US navy says the Chinese vessels went beyond the usual boundaries in shadowing and harassing the Impeccable, the BBC's Kevin Connolly notes. This may be an example of China testing the mettle of a new US administration, just as it did when it impounded a US reconnaissance aircraft immediately after George W Bush took office, he says. It held the crew of the plane, which was in collision with a Chinese fighter jet, for 11 days, causing a serious diplomatic row between the two countries. While relations between Beijing and Washington are complex, any sense of military competitiveness is dwarfed by America's need for China to continue buying US debt to fund its huge and growing deficit, our correspondent adds.